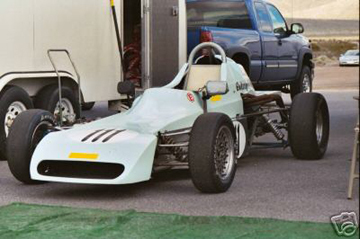 The Titan Mk 6 was one of the most successful Formula Ford racing cars in the US in the early 1970s. Today, they are one of the best choices for vintage Formula Ford. More than 200 cars were built, which is a huge number for Formula Ford. My car is car number 70623, frame number AM 70/48. I am still researching its history. 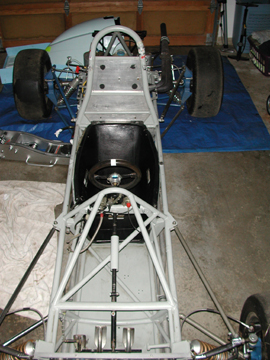 The chassis was built in early 1970, but SCCA did not issue logbooks until 1973. After it was logbooked, it was raced in the San Francisco Bay Area. In the late 1970s (or maybe early 1980s), the car was updated to meet then-current SCCA rules and significant changes were made to the car. Additional roll cage structure was added. The pedals were changed to floor mounted. 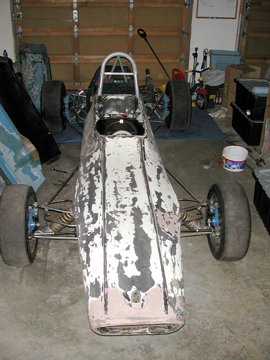 Crossle 32F/35F bodywork was installed, as were fabricated aluminum sidepods. In this configuration, it was raced against Jimmy Vasser during his Formula Ford days (he was first, what would become my car was almost last). The car was retired in 1987. Someone bought it in 2005 and ran it in a few races as a Club Ford with little success. I bought the car in the middle of 2005 and have started restoring to original (though I would like to keep some of the changes to note the history of the car).